New paper identifies every island worldwide where seabirds are threatened by invasive species. Santa Cruz, CA – To guide island-based seabird conservation actions, a new peer-reviewed paper has been published in the journal Conservation Biology. The paper identifies, for the first time ever, every single island and islet worldwide where globally threatened seabirds breed, as well as whether invasive alien species are present and threatening them. Seabirds are some of the most threatened marine animals in the world, with 29 percent of species at risk of extinction. Significant threats to seabirds occur on islands, which is where seabirds breed, including predation and disturbance from invasive alien species such as rats, cats and pigs. However, in many cases, effective island conservation can mitigate these threats. “Thanks to hundreds of collaborations from seabird biologists around the world, we were able to compile a global database that identifies islands where threatened seabirds are vulnerable to extinction. The Threatened Island Biodiversity database also highlights islands where invasive species eradications are needed or where protected areas are missing”, said Dena R. Spatz, first author on the paper and graduate student at the University of California, Santa Cruz. The paper, The Biogeography of Globally Threatened Seabirds and Island Conservation Opportunities, written by scientists from the Coastal Conservation Action Lab at the University of California, Island Conservation, and BirdLife International, identified all islands where populations of the 98 globally threatened seabird species (as classified by BirdLife International on the International Union for Conservation of Nature Red List) now remain, and documented the presence of threatening invasive species, protected areas, and human populations. This list was then refined to identify islands that have the greatest opportunity for interventions to benefit threatened seabirds. It will now form the basis of further priority-setting to determine where action is most urgently needed. Over 1300 present and locally extinct seabird populations (representing 98 species) were identified on 968 islands. Invasive species – a major threat to seabirds – potentially impact breeding populations on 60% of these islands. Only one third of threatened seabird islands (359 islands; or 37%) are formally protected (i.e. >90% covered in protected areas), and over half (534 islands; or 55%) have no legal protection. 83% of threatened seabird islands lack adequate protection and/or are threatened by invasive alien species. This research was funded by the David and Lucile Packard Foundation, the National Fish and Wildlife Foundation*, Island Conservation, the Friends of Long Marine Lab, and Dr. Earl H. Myers and Ethel M. Myers Oceanographic and Marine Biology Trust. 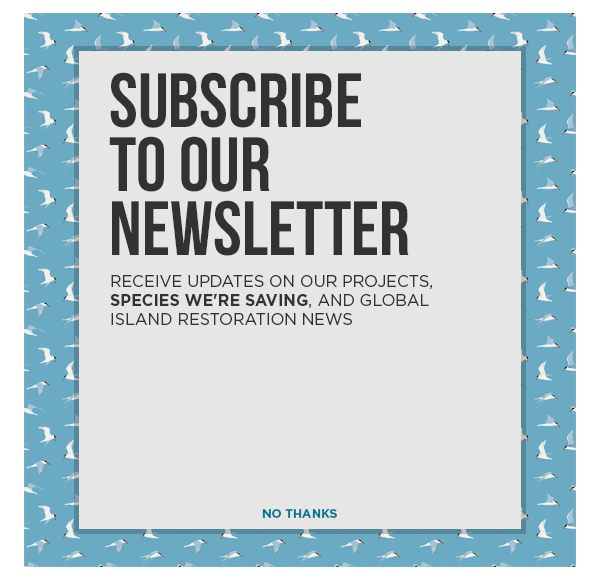 Click here or on the infographic image below by the David and Lucile Packard Foundation to learn more about seabird conservation through island restoration! Island Conservation is an international non-profit conservation organization headquartered in Santa Cruz, California with field offices in Australia, the Bahamas, Canada, Chile, Ecuador, Hawaii, Puerto Rico, and Washington DC. The mission of Island Conservation is to prevent extinctions by removing invasive species from islands. Over the past 20 years, we have deployed scientists to protect 977 populations of 389 species on 52 islands. BirdLife International is the world’s largest nature conservation Partnership. Together we are 120 BirdLife Partners worldwide – one per country – and growing with 13 million members and supporters, over 7,000 local conservation groups and 7,400 staff. BirdLife is widely recognised as the world leader in bird conservation. Rigorous science informed by practical feedback from projects on the ground in important sites and habitats enables us to implement successful conservation programmes for birds and all nature. www.birdlife.org. *The views and conclusions contained in this document are those of the authors and should not be interpreted as representing the opinions or policies of the U.S. Government or the National Fish and Wildlife Foundation. Mention of trade names or commercial products does not constitute their endorsement by the U.S. Government or the National Fish and Wildlife Foundation.